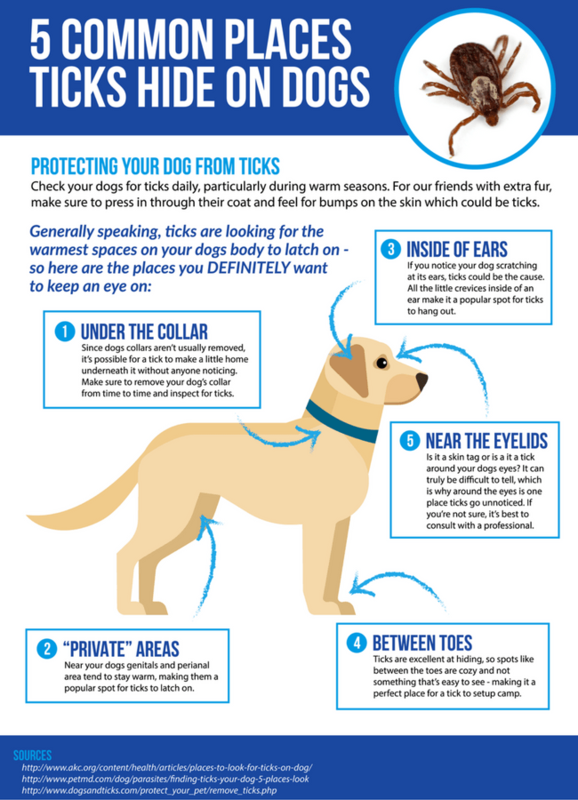 Flea And Tick Prevention For Dogs: Protect That Pooch! →Flea And Tick Prevention For Dogs: Protect That Pooch! Its spring, glorious spring! ...and dirty little bloodsuckers are out in force. Ticks and fleas are breaking free from their winter doldrums and brashly reclaiming their turf. If you want to know the best flea and tick prevention for dogs, read on. Although they both live on blood (ew! ), ticks and fleas are very different creatures. Like spiders and scorpions, ticks are arachnids, while fleas are small flightless insects that form their own order called Siphonaptera. Today, there are around 900 species of ticks and more than 2000 species and subspecies of fleas in the world. So, it’s no wonder that, when the snowmen start to melt, these pesky creatures seem to be everywhere. Because they are so different, knowing how to protect your dog from ticks and fleas can be tricky. Some prevention's will work for both ticks and fleas, while some are only useful for one or the other. As a result, there is an arsenal of solutions to suit your specific needs. Your tactics may include addressing the animals themselves and/or the environment. Don’t forget to protect yourself. You are just as vulnerable and can be a carrier too. No one element draws these efficient exsanguinators to a live target. Instead, there is a symphony of attractors. Knowing what turns them on, may be a great help in keeping them off. One key way that ticks and fleas know you’re a tasty treat is carbon dioxide. Yes, you breathe, they bite. When CO2 increases, these freeloaders are drawn to you or your pup like kids to ice cream. When put in a dark place, 93% of fleas will move to a lighted area in 40 minutes. (This plays well with the vacuuming suggestion below since most hard-to-reach places are dark.) Also, fleas are drawn to certain colors of light. Green-yellow light draws twice as many fleas as full-spectrum light. Fleas aren’t interested in inanimate objects. But move and there’s a feast waiting to happen. While warmth isn’t enough to make a flea jump, combine that with other key stimuli and they’ll try out for the Olympics. Fleas are most attracted to creatures with a temperature of 104oF (40oC), but they’ll still nibble on hosts as hot as 122oF (50oC) and a chilly as 80.6oF (27oC). For reference, a healthy dog’s temp averages around 101oF (38.3oC) to 102.5oF (39.2oC). Contrary to what you might expect from the notes above about light, fleas are most active a few hours before sunset. They stay active through the night. It’s speculated that the reason is because it correlates with the resting times of domestic pets. Yep, you read right. Ticks and fleas are not color blind. But, when you think about it, it makes sense that critters that are attracted to blood are also most attracted to red and blue. Fleas want to settle in on a host that will provide a good long meal. So you are much more likely to see fleas on German Shepherds than field mice. Ticks on the other hand, are less discriminating. They’ll attach themselves to a smorgasbord of other living delights, including mice, chipmunks and other rodents. Unlike fleas, ticks need lots of humidity to survive. That’s why you hear about sand fleas but never sand ticks. Mowing the lawn is such a pain that it’s easy to put it off “one more week.” Then, one day you wake up and think that maybe you see Shaquille O’Neal out there. But you’re not sure because you can’t quite see his face. If you call out, the ticks and fleas can let you know. Because, if he’s there, they’re totally partying all over him. Ticks and fleas just love tall grass! By keeping your grass short those creatures (ticks and fleas, not Shaq) have fewer places to frolic. Keep in mind that insecticides, whether chemical or natural, are designed to kill insects. Surprise! They often don’t, however, discriminate which insects they kill. This includes useful insects, such as bees and butterflies. As a result, you may want to steer clear of all insecticides. But, if your infestation has reached critical mass, consider your options carefully and avoid spraying when bees and butterflies are around. Some less harmful solutions include, Sulfur (if you can handle the smell) and insecticidal soap. Check out this site to see pesticide options that are more and less harmful to honeybees. You may also want to consider enhancing your yard with plants that attract beneficial insects and prevent pests. As a bonus, your yard will be less inviting to pests, but more inviting to your friends and family. While most ticks don’t carry diseases and most tick bites don’t cause serious health issues, some do. Effectively removing ticks can help you avoid such serious maladies as Lyme disease and Rocky Mountain spotted fever. Put on waterproof gloves—I prefer Nitril—to avoid having the tick’s liquid (blood and venom) touch your skin. Use fine-tipped tweezers and grab the tick as close to the skin as possible. Your goal is to grab the head, not the body. Pull straight up (keeping the tick perpendicular to the skin’s surface) in a steady even pressure. Don’t twist or jerk, as it can make the mouth and head break off and stay attached to the skin. If this happens remove the mouth parts with the tweezers. If you’re unable to remove them easily, let them be and let the skin heal. Clean the bite area and your hands with rubbing alcohol, an iodine scrub or soap and water. Dispose of the tick by placing it in a glass jar with rubbing alcohol. Once the tick is dead, many vets recommend sealing the jar and saving the tick in case you or your pet displays symptoms of disease. Reward your brave little soldier with lots of love—and maybe a treat or two. Some symptoms of tick borne illness include fever/chills, aches and pains and/or a rash. Lyme disease infection presents as a bull’s eye target-shaped lesion around the bite site. Rocky Mountain spotted fever looks like a spotted rash. For more information on symptoms, visit the Centers for Disease Control site. PRO TIP: Your goal is to remove the tick as quickly as possible. So, even though folklore tactics may seem better (and less disgusting), avoid such choices as painting it with nail polish or petroleum jelly or heating it with a match. Even if these techniques sometimes work, it is better not to wait for the tick to attach. Neither fleas nor ticks can swim. So, rinsing or washing your pup and yourself off after outings is smart, easy prevention. Hoses, showers and tubs can be your pup’s best buddy—even though she may not agree at the time. Do NOT use human shampoo on dogs. Humans and dogs have different pH levels. Human skin is more acidic while that of our fur friend is more alkaline. Using human shampoo on dogs disrupts the acid balance on their skin and leaves it open to bacteria, parasites and viruses. It also makes it tougher for the pup’s protective layer of oils to replenish itself and will cause dry, flaky, irritated, peeling skin. This will, in turn, make them scratch and may lead to more serious problems, like infections. Plus, if your little one’s skin is out of balance, she will actually end up smelling worse due to the increased bacteria levels. Shampoo manufacturers offer a massive spectrum of options. Your choice may be based on scent, texture, ingredients, price or any number of other factors. Since my sweet thing is extra sensitive, I prefer shampoos that are unscented and have no artificial ingredients with mild moisturizing properties. Vitamin E, aloe aera, avocado and honey are a few moisturizers I watch for on the label. If you’re into fragrance, you may want to add a drop or two of essential oil to an unscented shampoo. Use it sparingly. Dogs have up to 300 million olfactory receptors, while humans only have about six million. Along with that, the part of a dog’s brain dedicated to smelling is, proportionally, about 40 times bigger than ours. So, your Snifferton’s sense of smell is Everest while ours is a garden gnome. That said, natural fragrances such as chamomile, lavender, eucalyptus, and citrus scents can serve as pleasant insect repellents. Double-check before using essential oils on your cat. Kitties can have bad reactions due to grooming. PRO TIP: Dogs and cats are different. (Duh.) So always confirm that a canine product is feline-safe before using it on both your cat and your dog. To keep from bringing fleas and their friends indoors when you come from an infested area, put your clothes in a plastic bag before entering the house. Take them off first. A garage would be handy for this step. Launder what you can in hot water on the longest wash cycle. Laundry detergent might be a nice touch too. But remember that your dog’s snout can smell way more than yours, so she’d probably appreciate natural unscented detergents. After the wash, dry the items on the hottest setting. For soft items that you can’t launder, like plush toys, pillows or couch cushions, put them in the dryer on the hottest setting for 30 minutes. This will kill mites, fleas, ticks and a host of other nefarious beings. As a bonus, it will fluff out dust too. Another weapon on the war against creepies is your vacuum cleaner. Fighting one sucker with another will help keep your home flea free. In in a study conducted by Ohio State University, vacuuming not only collected the pests, but actually killed an average of 96% of the adult fleas. If you are tempted to end the other four percent by tucking a flea collar into your vacuum cleaner bag as some suggest, think again. While it sounds clever, the collars can give off harmful fumes. Deciding how to protect your dog from ticks and fleas on an ongoing basis is a challenging process. There are scores of commercial and natural products, each with merits and shortcomings. Mainstream options generally fall into one of three categories: topical, external and ingestible. There is no one perfect solution. As the name suggests, spot on products are used by dabbing a spot of product onto your dog somewhere that he can’t reach with his mouth. The key active ingredients in most canine flea and tick medications are insect neurotoxins. The neurotoxin poisons the flea or tick by attacking its central nervous system. These products are designed to kill the insect slowly so that it has time to return home and share with its relatives. After the neurotoxin kills the adults, Juvenile Hormone Analogs, also known as Insect Growth Regulators (IGRs) swoop in to prevent larvae from making it to adulthood and reproducing. PRO TIP: While heartworms are carried by mosquitoes, some spot on prevention options, like Revolution, cover ticks, fleas and heartworms. From 2009 to 2013, more than 2000 pets were reported to have died in North America as a result of exposure to flea and tick products. According to the Canadian Pest Management Regulatory Agency (PMRA), spot on treatments were responsible for approximately 80% of the incidents. For those of you who own both a cat and a dog, flea treatments can be especially worrisome. Permethrin, a chemical commonly used in over-the-counter dog treatments, is highly poisonous to cats. Some owners are lulled into thinking that, if the medicine is OK for their dog, a smaller amount will be fine for their cat too. This is absolutely not the case. Permethrin is so toxic, in fact, that if you put it on your dog and he rubs it on shared bedding, grooming tools or, heaven forbid, the cat grooms the dog, your sweet feline fluff can become seriously ill or die. Dog flea and tick product toxicity in cats is a medical emergency. One symptom is uncontrollable shaking. If you suspect that your cat has been exposed and is shaking or just not right, take her to the vet immediately. PRO TIP: Permethrin, which is often used in spot on products, is HIGHLY toxic to cats. Two leading product lines that contain permethrin are Advantix and Protical. Flea and tick collars perform two basic functions. One form repels pests by emitting a gas. The insecticide in this type of collar is only effective after the parasite has bitten the dog. The second option has medication that seeps into the fat layer on the dog’s skin or has active ingredients that spread using the dog’s natural skin oils. This collar emits active ingredients that kill fleas and ticks on contact before they bite. Since flea and tick collars are worn around the neck, they are most effective in that area. They become decreasingly effective as the pests attack closer to the tail. Her research revealed that kids could be exposed to higher levels than the Environmental Protection Agency considers safe. Exposure to the types of pesticides used in flea collars may be linked to behavioral problems, cognitive delay and problems with motor development. Avoid all collars that contain tetrachlorvinphos (TCVP). This chemical is thought to be a neurotoxin that may be harmful to both pets and humans. Although some flea collars claim to be water resistant, none are completely water proof. A number of collars don’t even claim to be water resistant. When flea collars get wet, the chemicals they contain can be released more quickly into the water and into your pet. Not only does a wet flea collar pollute the water and reduce the collar’s effectiveness, it can also be toxic for your pooch. So, to be safe, if your dog will be exposed to water through bathing, swimming or any other heavy-moisture activity, remove the collar until your fur gator is completely dry. 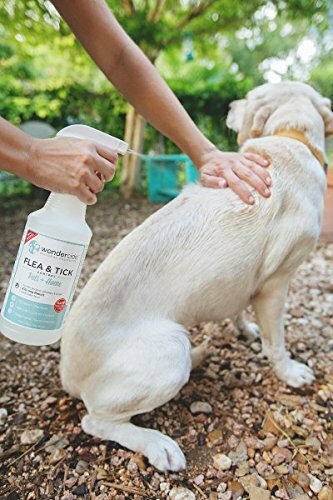 As with spot on treatments, flea and tick sprays interrupt the insect’s nervous system to kill the adults, while growth inhibitors prevent the young from maturing to the age of fertility. Sprays should always be applied outside and with great caution to prevent the chances that you, your pet or children will inhale or ingest the poison. Your pup doesn’t smell like insecticide or have the opportunity to spread chemicals around the house. Another benefit is that oral medication can provide almost immediate results. The down side is that currently there are no oral medications that treat ticks. Spinosad works quickly and kills fleas while preventing future life cycles. Nitenpyram only kills adult fleas and won’t end future infestations. Lufenuron doesn’t kill adult fleas but does prevent future flea fests. Because of the various virtues, many products contain more than one of these active ingredients. Most guardians of the fur force will agree that knowing how to protect your dog from ticks and fleas is the least adorable part of owning a dog. It has taken me more than a decade to settle on solutions that work for both my little girl and for me. 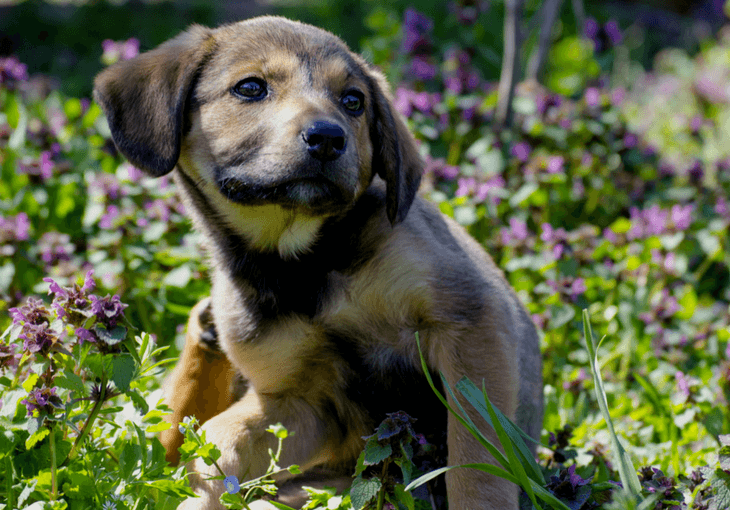 I hope this article on flea and tick prevention for dogs will help you cut through the weeds, both figuratively and literally, to find the perfect solution for you and yours.